5-m diameter GHz antenna, Kersten Physics Teaching Center of the University of Chicago. The MIDAS (Microwave Detection of Air Showers) telescope is a 5-m diameter GHz antenna currently located at Kersten Physics Teaching Center of the University of Chicago. MIDAS is pursuing a novel detection technique for Ultra-High Energy Cosmic Rays (UHECRs) based on microwave emission from the air plasma produced by the cosmic ray shower in the atmosphere. 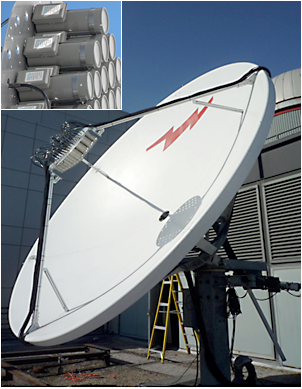 Microwave signals from UHECRs are minimally attenuated by the atmosphere, even in presence of clouds or rain, and are detectable day and night, allowing for large area coverage at low cost. The MIDAS technique may play an important role in the development of future very large UHECR detectors. During 2011, the MIDAS prototype will be installed at the Pierre Auger Observatory in Argentina for coincident detection of UHECRs. PhD Thesis Defense, Christopher Williams: "A Search For Microwave Emission From Cosmic Ray Air Showers"
KICP Talk, Special EFI Seminar: Pedro Facal, University of Chicago, "Radio-detection of ultra high energy cosmic rays"